Once again, CCL members were ubiquitous on Capitol Hill during our lobby day, which was held on June 13. 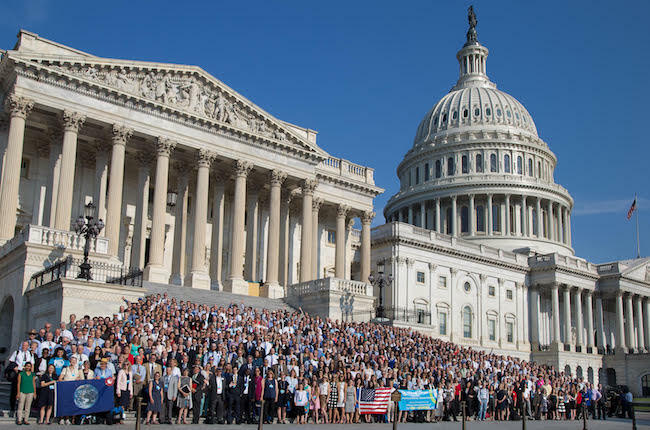 In order to ensure that volunteers who lobbied got to attend at least three meetings, we had to limit the number of folks meeting with congressional offices. Approximately 1,000 advocates took part in the 500 meetings that were scheduled. You’ll be getting a visit today from 1,000 of your constituents who have traveled to Washington from across the nation. They come because they’re worried we won’t have a habitable planet if we don’t reduce the heat-trapping gases that are inexorably warming our air, oceans and land. They won’t be marching up Constitution Avenue beating drums, waving signs and chanting clever couplets. Not that there’s anything wrong with that. Protests are a great way to get people’s attention, but at some point we have to move from getting attention to having a conversation. Instead, the people visiting you today will be wearing suits and business attire, arriving at your offices for scheduled appointments, just like the folks who pop in from K Street. The only difference is that they’re not getting paid to talk to you. Their compensation, hopefully, is a livable world.